Tweetbot for macOS offers compelling features, but there’s a countdown clock for some elements that Twitter might limit. To start an animated GIF, all you need to do in Tweetbot 3 is move your cursor over the image. 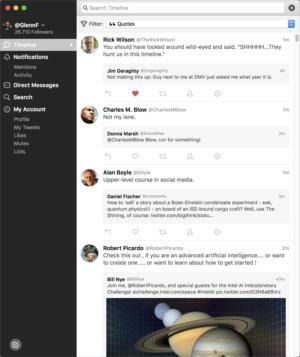 The app’s approach focuses on what would now be called “classic” Twitter: a chronologically organized timeline with the newest tweets at the top, and an option to autoscroll as new tweets appear. Like other third-party apps, Tweetbot 3 doesn't show Twitter ads. When composing a message in Tweetbot 3, you can drop in images, set location, and click to bring up an emoji selector. Tweetbot uses different views, which correspond mostly to Twitter details, to let you examine various aspects of Twitter related to your account, like lists, direct messages (one-on-one only), and your Twitter likes. 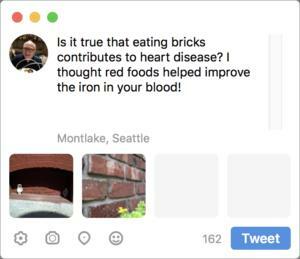 This includes the Mutes view, which is a custom feature—not the same as Twitter’s account-based mute—that lets you suppress keywords, people, hashtags, and even specific Twitter clients for periods of time or forever. Mutes uses iCloud to sync across other iOS and macOS copies of Tweetbot. As before, Tweetbot provides support for linking in multiple accounts, each of which can have certain unique preferences, such as to which service images or video are uploaded before a tweet posts. It’s two clicks to pick and switch to another from a main window pop-up menu. A right-click on the retweet button or like button in any message brings up a list of accounts to choose among as an alternative to using the account currently active in that window. 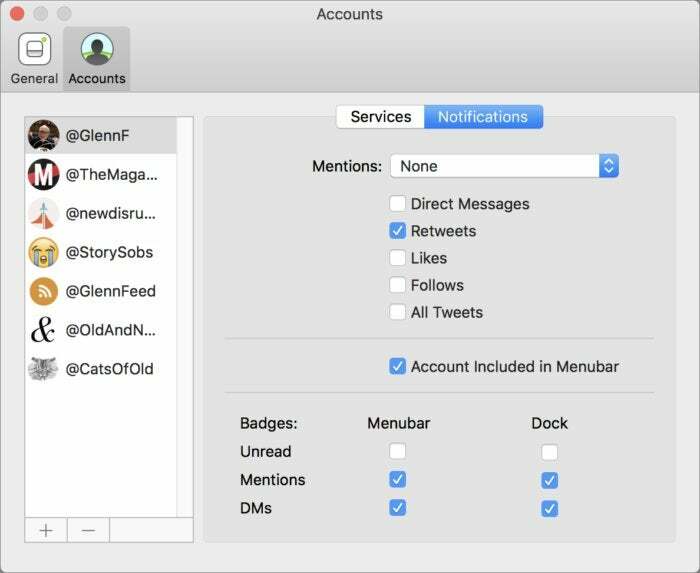 Tweetbot 3 allows per-account settings for certain items, such as notifications. As in previous versions, you can open multiple windows at once that display different accounts, and have multiple columns in a single account window that show different Twitter views, such as lists, notifications, and activity. The columns can be dragged and rearranged in version 3. With multiple windows open, the timeline scrolls for each account. The multi-column view lets you track across different aspects of an account simultaneously. Tweetbot 3 allows the creation of custom filters, which can help you focus what you see (or exclude) in a view. Tapbots doesn’t believe in manuals or even item-by-item detailed descriptions of their apps. That’s fine for discoverable and intuitive features, but less so when there’s no way to suss out how something works. For instance, in the previous release, the nine main sidebar features had Command-1 through -9 assigned. That’s true in version 3, but there’s no indication it works. 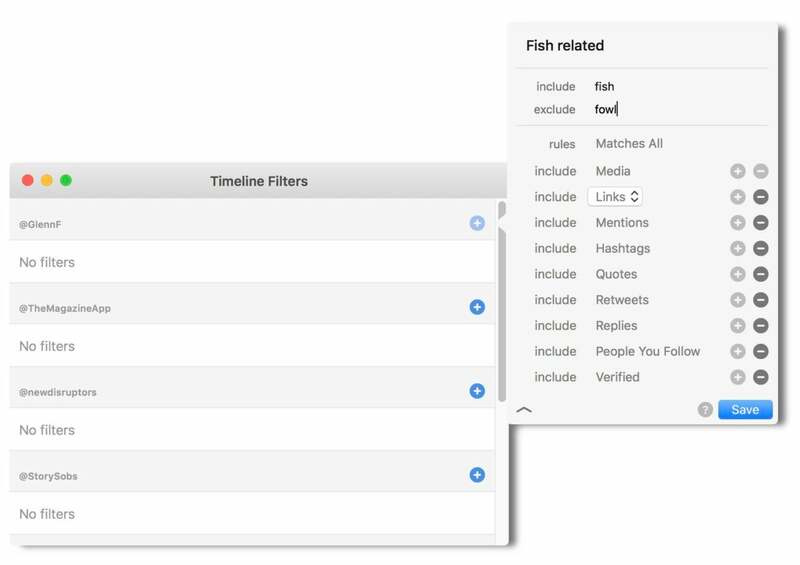 The timeline view can be winnowed with prefab and custom filters. It also seems odd that one of the best custom features in Tweetbot for iOS still isn’t in the macOS version: Stats, a combined activity view that shows tweets in newest-to-oldest order that have had any of a variety of actions performed upon them, like someone liking or retweeting a message. As with Tweetbot 2 for macOS, in version 3 you can only view raw activity—a kind of log of actions, such as likes or new followers—or replies and mentions. Tweetbot added a Topics feature in its previous release that lets you thread tweets by creating a kind of container into which to link them. But I find this formal process more fussy than Twitter’s native approach, which is just a plus sign at the bottom of a tweet composition window allowing successive additions. There’s a sword dangling over Tweetbot and other third-party Twitter clients’ heads: Twitter will discontinue access on August 16, 2018, to the live (or “streaming”) per-client access that these apps rely upon for real-time interactions and push notifications, which require server-side separate access. (The removal of this third-party access was recently delayed by two months.) Twitter has promised a new kind of developer support for real-time feeds, but hasn’t yet unveiled it. Tapbots and other third-party developers believe this could prevent continuous, up-to-date timeline refreshing, and prevent or delay push and in-app notifications of mentions and other activities. The company and three competitors posted a website that lists their concerns. Tweetbot will continue to be useful if Twitter fails to provide new, comparable features and access: reading and posting would remain the same, even if new tweets are delayed by a minutes or a few. Years into some features, Twitter has still not provided access to third parties, as well, including group direct messages, Twitter polls, and bookmarks. It’s unclear whether these will be part of the new access the company promises or remain proprietary. Twitter cancelled its self-developed macOS app in March 2018, and the Twitter.com website is a middling alternative to a native app. Tweetbot is idiosyncratic, as are all its third-party Twitter options for macOS (and other platforms): it makes strong choices that may or may not fit the way you want to compose and manage tweets. But it’s a solid app with only a few missing pieces, and more polished than its previous release. For committed Twitter users, social or professional, the price tag matches its value. This story, "Tweetbot 3 for macOS review: Twitter app pushes forward in usefulness and design" was originally published by Macworld.